Thank you for your patience as registration pages load. All paperwork is now online. Select an individual camp below for much faster check-out. Summer camps at Gilbert House Children’s Museum utilize a hands-on, inquiry-based approach. Experienced educators guide all the learning opportunities. Our staff, our methods, and our children’s museum environment create the perfect combination for a fantastic summer camp experience. Camps are designed to be fun, creative, and original as we highlight the best of what the Museum has to offer. *If you are a member, be sure to set up your online account so you will receive your Member Discount for camp registration. Registration is online only. Please email education@acgilbert.org if you need assistance, and we’ll get back to you as soon as possible. We offer morning-only Preschool/Kindergarten Camps for children ages 3-5 as well as all-day Elementary Camps for Grades 1st-4th. We additionally offer morning and aftercare options for our Elementary Camps. *Morning and aftercare options are not available for Preschoolers & Kindergartners. At least one week advance registration required for morning care and aftercare. Prior to registration, please read our camp policies and payment/cancellation policies HERE. Step into a time machine and get ready for exploration! Campers will experience life from different eras through themed crafts, games, and active learning. Journey from Ancient Egypt to the U.S. Pioneers. Preschool Time Travelers Camp will focus on Pioneers. Campers will gain experience with different mediums of art including drawing, watercolors, acrylic paints, and sculpting with clay. Campers will develop new skills and hone their creativity! Learn expert sleuthing skills fit to solve any case… Campers will practice finger printing, encoding messages, experiment with invisible ink, and more while they put their skills to the test. Shh… top secret! All about animals! Learn about habitats, the food chain, and endangered species. Campers will participate in labs and active learning. Campers will learn about the elements of story through creation of comic strips, flipbooks, stop motion animation, and computer animation. *Preschoolers will attend Storytelling Camp this week with age-level activities and visual props. Abracadabra! Learn to dazzle and amaze through a variety of magic tricks and magical chemistry. Campers will explore optical illusions, the art of misdirection, and make a magic kit to take home. Can’t decide or love them all? This week will be an exciting combination of the “best activities” from the entire summer! Our summer camps help kids learn to use real objects as they explore real-world concepts. Our unique museum environment is filled with hands-on learning opportunities for campers of all ages. Our small staff to student ratio allows for personal instruction. Our campers benefit as a close-knit team of learners, allowing for advanced activities unique to Gilbert House Children’s Museum. We offer the convenience of optional morning and afternoon extended care. Full day camps run from 9:00 A.M.-4:00 P.M.; with extended care available from 8:00-9:00 A.M. and 4:00-5:00 P.M.
Our camp staff are trained museum educators who understand how to engage kids in out-of-school environments. Our educators bring a wealth of knowledge and experience to share with campers and go through a thorough background check and interview process. Children of all abilities are encouraged to participate in our camps and classes. In order to ensure a fun and safe experience for your child, please inform us if your child has any allergies and/or special needs. 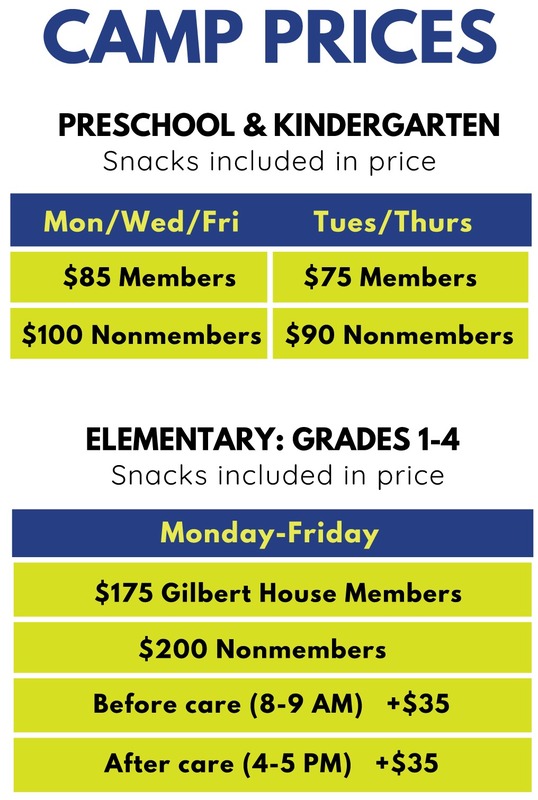 Gilbert House Children’s Museum does not provide 1:1 supervision for participants needing assistance with personal care; however care providers* are welcome to attend camp or classes at no extra charge. Please email Julia Golden, Programs Coordinator, at education@acgilbert.org if you would like to inquire further. Gilbert House Children’s Museum reserves the right to request 1:1 supervision for participants. If an adult caregiver’s intention for staying is to help their child transition for a portion of the camp day, no background check is needed. If the adult caregiver’s intention is to stay for the entire camp or class to support a child (i.e. first drop-off experience, medical support, need for 1-on-1 support, etc.) they will need to complete a background check. The cost of the background check is $20 and parents will be asked to pay this fee.